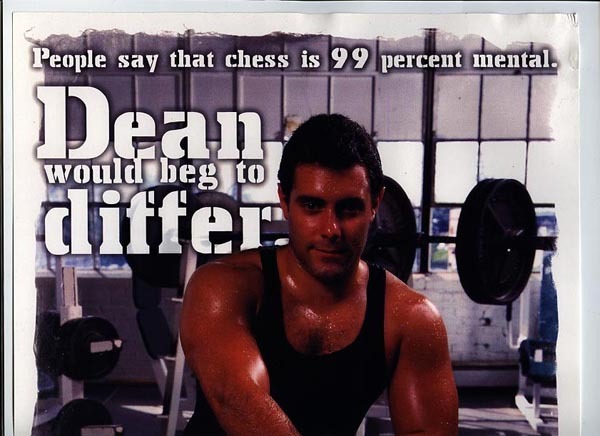 IM Dean �the dream� Ippolito spends most of his time preparing for his games not by his computer or by a chessboard but instead in the weight room. His unrelenting regimen of bench presses, leg curls and pushups give him the physical energy he needs to play a tough game of chess. He likes to play VERY positional openings with the white pieces. With the black pieces he used to play the Petroff exclusively until too many people told him how wimpy it was and too many 1700 players traded queens on move 5. Since then he sometimes plays the Sicilian to keep the critics off his back. Despite the fact that Dean plays some �wimpy� openings, I can assure you he is quite a good calculator and has a lot more imagination then you would expect from his repertoire. He is an extremely hard fighter, very resourceful and never gives up�..this has saved him a lot of games in the past. One of the biggest barrier between Ippolito and the higher levels is his penchant for giving too many easy draws away to stronger players, however if he overcomes this psychological desire for a draw, he could make some serious strides.